Wave action and drainage erode shorelines. Pounding wave action and poor drainage on steep slopes slowly cause shoreline erosion. If not repaired, they have negative impacts on property value, safety, and especially aesthetics. Convert problem areas into living features that highlight landscaping. 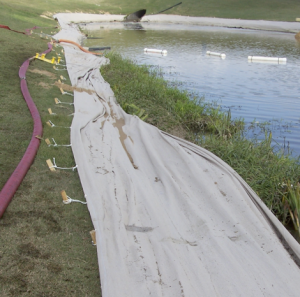 Reclaim damage with the innovative aquatic restoration process–dredgesox. Dredgesox are laid at the water line. Water is one of Nature’s most corrosive elements. Sooner or later, it creates erosion. In the past, erosion was managed with rock rip rap, cement bags, and related base materials. 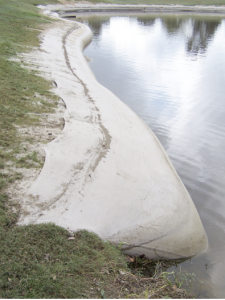 Today, specialist use a popular dredgesox process to restore effected areas in a way that blends with the surrounding environment. Amphibious workboats operate in water and on shore. Versatility lets the boat navigate in places not accessible to most equipment. The unit’s weight distribution lets it float and displace lightweight pressure when traversing land. 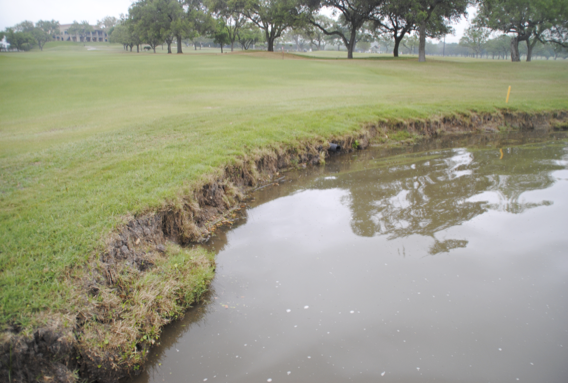 They are used extensively around waterscaping in residential communities, golf courses, and other sensitive conservation zones. Sediment is pumped into mesh socks. Water drains out. Content firms. 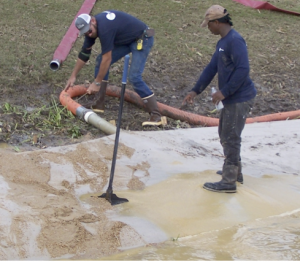 Dredgesox enhancement is perfect for rebuilding lake-front shoreline by your home or dock. The boat removes organic bottom sediment along the waterline and pumps it into a porous sock anchored along shore. When the bag is filled, vegetation is planted or sodded on the mesh sock so grass grows into the bag for long-term stability. Subsequent vegetation can be maintained with other portions of the lawn. Identify existing conditions and causes. Outline commercial techniques for restoration. Create a plan and project budget. 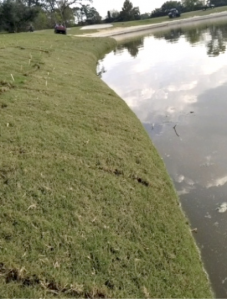 On this project, sod was used to establish a manicured lawn to the lake. Finished sock forms permanent structure to prevent future erosion. This entry was posted on Wednesday, January 23rd, 2019 at 3:42 pm	and is filed under News & Updates. You can follow any responses to this entry through the RSS 2.0 feed. Responses are currently closed, but you can trackback from your own site.